Vultur gryphs Proper with wings inverted displayed, facing dexter with an olive branch on bill, Or ribbon in base. Or,in chief on azure in center a golden pomegranate and on sinister Or cornucopia with golden Spanish coins and dexter Or cornucopia with fruits and vegetables, in fess on platinum in center a phrygian cap gules held on proper lance, in base on azure the isthmus of Panama vert on fess with a ship in chief and in base. 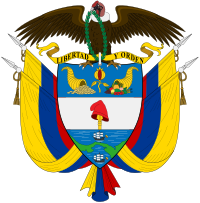 Two flags of Colombia surrounds the arms. On top the ribbon with the words Libertad y Orden - Liberty and Order. On the bottom the supporters intertwine. Presidential flag, official paperwork, military insignia. Àmì ọ̀pá àṣẹ ilẹ̀ Kòlómbìà je ti orile-ede Colombia. Àtunṣe ojúewé yi gbẹ̀yìn wáyé ni ọjọ́ 20 Oṣù Kẹ̀wá 2015, ni ago 04:45.